CINCINNATI – (June 30, 2014) The Cincinnati Zoo & Botanical Garden is excited to announce the grand opening of the next phase of its AFRICA exhibit, now open! Here, visitors will immerse themselves into the African Savannah, featuring East African architecture, landscape, and natural elements, while taking in the sights and sounds of one of the most majestic countries in the world, right in their own back yard. The Cincinnati Zoo’s new signature exhibit, Painted Dog Valley, is the featured exhibit in this phase of the opening. The exhibit highlights one of the most predatory and endangered species in all of Africa – the African painted dog. Known for their famously large, round ears and beautifully “painted”, multi-colored coats, the African painted dog exhibit will have a crystal clear waterfall, two large eye-to-eye viewing windows, and multiple vantage points. At the turn of the 20th century there were more than 500,000 painted dogs in 39 countries. Today, there are only 3,000 dogs in Tanzania, Kenya, Zimbabwe, Botswana, and South Africa combined, making them the rarest species on the African continent. In addition to African painted dogs, visitors will enjoy the breath-taking beauty of a new open-vista exhibit, featuring, impala, Thomson’s gazelle, ostrich, pink-backed pelican, and Ruppell’s vulture, to name a few! Visitors will watch as a variety of species graze on tall grasses, make stops at the watering hole, and laze about under the summer sun. Over the summer this herd will continue to grow, as animals are added in phases to ensure a calm and safe introduction to each other and the exhibit space. The experience that this phase of AFRICA affords Zoo guests is modeled after the South Rift Valley region in Kenya where the Zoo supports many community-based conservation efforts. As with all Cincinnati Zoo projects, the AFRICA exhibit is being built to LEED standards, pursuing Gold certification. Additionally, the African painted dog indoor enclosure is taking GREEN to whole new level through the Living Building Challenge (LBC). The LBC certification is based on the buildings location, water usage, energy usage, health, materials used, equity, and beauty. If the Cincinnati Zoo receives the official certification, it would not only be the first Zoo in the country with a LBC building, but it would be one of less than 10 buildings in the entire U.S. with the certification. 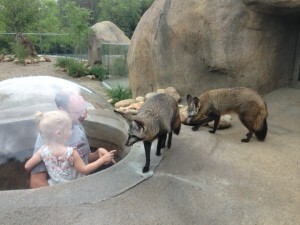 Bat-eared foxes in Africa exhibit. In addition to the new African Savannah and African painted dog exhibits, a third exhibit space was also completed during this exhibit opening – the future site of meerkats. 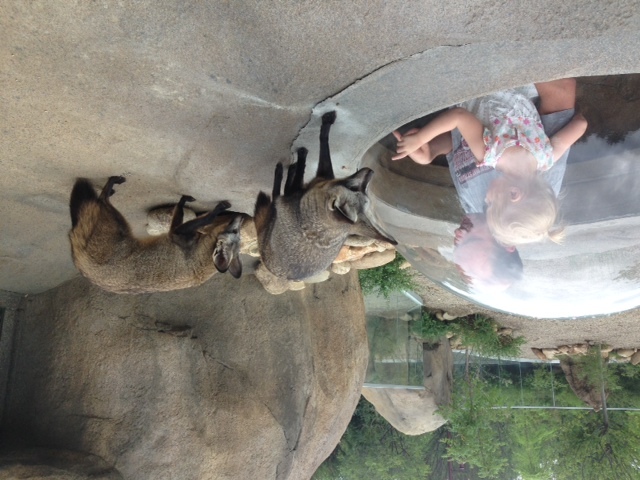 Currently, this exhibit is home to the Zoo’s bat-eared foxes, with meerkats arriving Summer 2015! 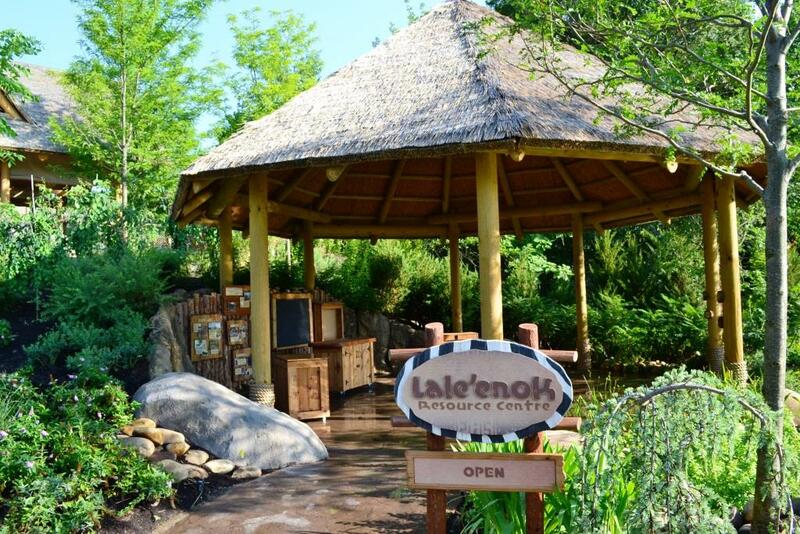 Located along the path, across from the African savannah, is the Lale’ enok, a thatch-roofed, open-air shelter that contains signage interpreting human-wildlife coexistence and highlighting the Cincinnati Zoo’s field partnership in Kenya. Through its conservation programs, the Zoo helps fund activities at the Kenyan Lale’enok Resource Centre, which was constructed in 2011. Owned by the Olkirimatian Women’s Group in the South Rift Valley of Kenya, the Lale’enok provides the local Maasai community with a forum to engage with partner scientists and conservationists to support both wildlife conservation and thriving livelihoods. The Maasai people maintain their coexistence with lions and other wildlife through a community-based conservation program called Rebuilding the Pride. A partnership between the South Rift Association of Land Owners (SORALO), the African Conservation Centre (ACC), and the Cincinnati Zoo, Rebuilding the Pride works to restore a healthy lion population while reducing the loss of livestock to lions. Zoo guests are invited to participate in the story by purchasing a symbol of this coexistence—beaded bracelets handcrafted by Maasai women and sold in the Zoo’s Lale’enok, inside of AFRICA, as well as the Zoo Gift Shop. All funds raised go back to the Maasai community. 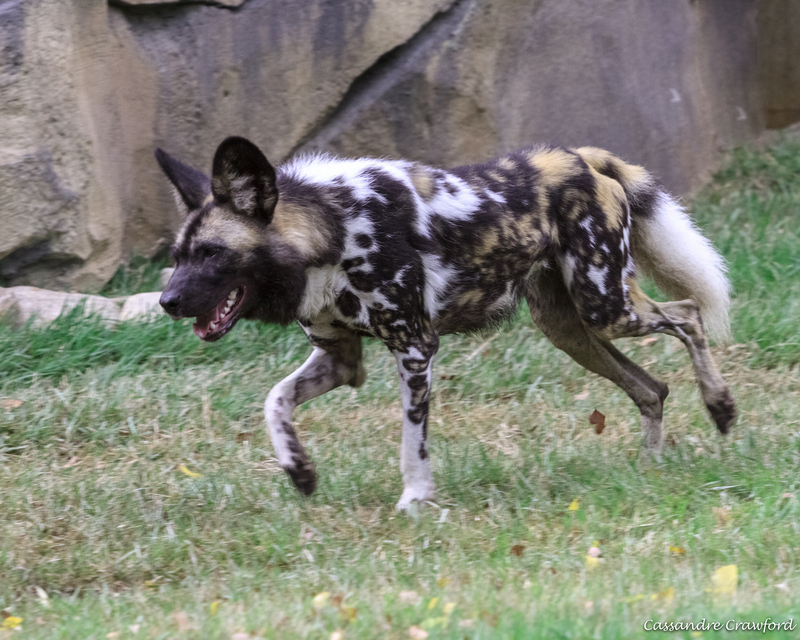 To continue to connect Zoo visitors with Africa, the Cincinnati Zoo, along with the Angel Fund, supports the conservation of African painted dogs and other wildlife in southern Tanzania through the Ruaha Carnivore Project (RCP). The RCP works with local communities to ensure the survival of carnivores and people in and around Ruaha National Park. The third largest African painted dog population lives in the Ruaha region and is also home to 10% of Africa’s lions. The RCP documents the presence and location of wildlife species through community-reported sightings and photos taken by motion-triggered cameras, or camera traps. The project aims to gather baseline data on carnivore numbers and ecology and work with the local communities to reduce human-carnivore conflict. Phase IV of AFRICA has been made possible with the generous support of lead gifts from the Marge & Charles J. Schott Foundation, Robert & Adele Schiff Family Foundation, Harry & Linda Fath, the Procter & Gamble Fund, and the Kerry & Norah Clark Family Foundation. Phases I & II of AFRICA, the first of five phases, were completed in 2010 and included an expanded yard for the Maasai giraffe, a new greater flamingo exhibit, and a new and improved Cheetah Encounter where guests witness cheetahs doing what they do best – running! Phase III was completed just last year in 2013 and included a new African lion exhibit that holds our two new lions, a reinvented cheetah exhibit, and a newly renovated Base Camp Café. The Zoo is still in the midst of a capital campaign to complete Phase V, needing roughly $7 million, which will bring the much anticipated Nile hippo exhibit during the Summer of 2016. The hippo area will give visitors a dramatic experience by providing both above and below water viewings! Visit AFRICA – opening June 28at the Cincinnati Zoo. It’s closer than you think! AFRICA is free with regular admission.